Grafton’s recorded history dates back to the mid-1800s when German immigrants came to the new world in search of political and religious freedom. Prior to this immigration, the area was a dense forest. Missioners known as “circuit riders” rode out from Milwaukee on horseback to minister to the Germans. These priests kept the Word of Christ alive. Our parish roots can be traced back to the 1840s in Town Ten, a few miles west of Grafton, where the first Catholic Church in the area, St. Francis Xavier, was established. Years later the population shifted to Grafton and St. Francis Xavier was closed. Guided by two circuit riders, Fr. Joseph Salzmann and Fr. 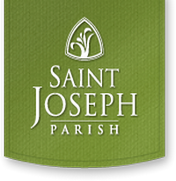 Joseph Sadler, the people of Grafton founded St. Joseph parish on November 7, 1849. A Mass celebrating this unity of faith was held at the Grafton Courthouse. In 1860 a permanent place for worship was built; in honor of its founding fathers, it was named St. Joseph. It was a simple stone church with a small wooden steeple and cross to distinguish it from the ordinary schoolhouse. In 1864 lightning struck and most of the building and furnishings were destroyed; a mission society from Bavaria sent money to help defray the expenses for rebuilding. The 1880’s brought the railroad and industry to the area. In 1897 a new church was erected to accommodate the growing population. Its architecture was similar to the styles of Western Europe. The interior was ornately decorated. In 1890 a school was established and classes began in a typical schoolhouse. The first teacher was a layman, but in 1909 Franciscan Sisters came to teach. A larger school was built in 1922 with living quarters for the sisters in the upper level; many parishioners helped with the construction. With population growth, the school enrollment increased, and in 1956 a new school was built. The two buildings were used simultaneously until 1975 when the older building was razed. The development of the freeway brought Grafton to the doorsteps of Milwaukee and subdivisions began to crop up. In the late 1960’s there was a significant increase in parish families. Crowded conditions at Mass led to the building of a new church. On Christmas Eve, in 1968, Mass was celebrated for the first time in the current church. The decade of the 70s was a period of adjustment as the ripples of Vatican II started to take effect. For St. Joseph the adjustment was intense as the small community was growing rapidly. With the establishment of a Parish Council and its committees, consultation and consensus was initiated to assist the pastoral staff. The reinstatement of the Permanent Diaconate in 1977 gave our parish added service. Due to the priest shortage taking place in the 1980s more laity began answering the call to serve the church. The 1980s and 1990s brought another shift in parish life. Ministries expanded and persons trained in particular ministries were hired, who along with the pastor make up the staff carrying out administrative duties. In 1983 Sacrificial Giving was implemented, encouraging parishioners to take seriously the scriptural mandate of giving 10% back to God by tithing and sharing time and talent. In 1998, because of more growth a committee was formed to study the space needs of the parish, as well as make changes in the worship space. Throughout 1999, which also was the 150th anniversary year, there were parish listening sessions and meetings with the architect discussing needs and costs. On the feast of St. Joseph, March 19, 2000, ground breaking for a new addition took place. For a year, the congregation watched with anticipation the many changes and additions. On the feast of St. Joseph, 2001, Archbishop Rembert Weakland joined our parish for the dedication of the new facilities.